I went from the high octane action novel The Two Deaths of Daniel Hayes into the more laid back classic P.I. novel, Missing Daughter, Shattered Family. David Lloyd is a former police officer turned private investigator who is hired to find the missing daughter of a prominent Toronto family. The young woman has not contacted her family in months, something highly unusual for her. Her history of drug abuse and mental illness make it all too easy to assume she either took off or possibly overdosed. As the case unfolds, David finds that not all the facts are lining up--nor are all the people he is interviewing being completely honest with him. The closer he gets to the truth, the more feathers he ruffles, and the more someone turns to violence to warn him away. Missing Daughter, Shattered Family was refreshing in its old school detective approach. David does a lot of leg work, interviewing friends and family of the missing woman. The novel starts out slow admittedly, but it didn't take long for me to be hooked in, wondering what the author had in store for me--and her characters. David is a likeable guy. He has all the makings of a good detective. He is ethical and diligent. He isn't easily intimidated and he is ever persistent. He looks beyond the words spoken to him and seems to be a good judge of character. He knows how to turn on the charm and use it to his advantage. David's past comes back to haunt him as he works on the case and he comes face to face with the police officer who got him kicked off the force. Beaten severely, resulting in a knee injury and hearing loss, as a result of being gay, David had no choice but to step down from his position on the police force. He knows the men who beat him were fellow police officers, but unfortunately he has no proof. Memories from that incident come flooding back and David struggles to deal with his past as well as search for the missing girl. The author could have taken this in several different directions, but I like how it was kept in the background. It clearly was a significant and horrific event in the protagonist's life, shaping who David had become, but it never overshadowed the main story line. On the home front, David is dealing with personal issues as well. His long time partner, Jamie, has still not come out to his family and coworkers. This has created some tension between the two men, which finally comes to a head. I really got a feel for how both men must have felt and my heart went out to Jamie. The personal story line played nicely into the main plot--giving it a nice balance. As with any mystery, such a side story makes the characters more real in the reader's mind. It helps paint a fuller picture of the character as a human being. And it did for me in this case. As an aside, kudos for the author for throwing in the paperwork! How often do you see the protagonist in a mystery actually complete any of the required paperwork? It was realistic touches like this that made me especially appreciate the novel. The mystery was at times predictable and formulaic, but I enjoyed getting to know David and following him along on his investigation. 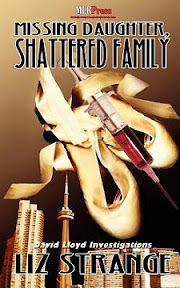 Overall, I enjoyed Missing Daughter, Shattered Family. I wouldn't have heard of this novel had it not been for its being short-listed for an Independent Literary Award, and so am grateful to have had the opportunity to read it. I always look for a mystery thriller with something unique from the rest...so often they are forgettable. I like the fact that the protagonist is gay (I've seen gay sidekicks only), which throws a whole new dynamic into a profession that is steeped in machismo. I'll keep my eyes open for this one. Sounds like another one to add to my list. I agree with Sandy about this book being unique to this genre (or at least as far as I have ever heard of) and that makes it more intriguing for me to check out. Even though this isn't my normal read I still like the sound of it and the old school feel you describe! This does sound rather different, and like something that I would really be interested in. I also think that the gay investigator angle is very, very intriguing. Awesome review today! Glad you enjoyed this one. It sounds like a different type of mystery novel, but different in a good way. This one sounds good as well. I'm pretty sure that I've added all of these books to my TBR list :) Great reviews!